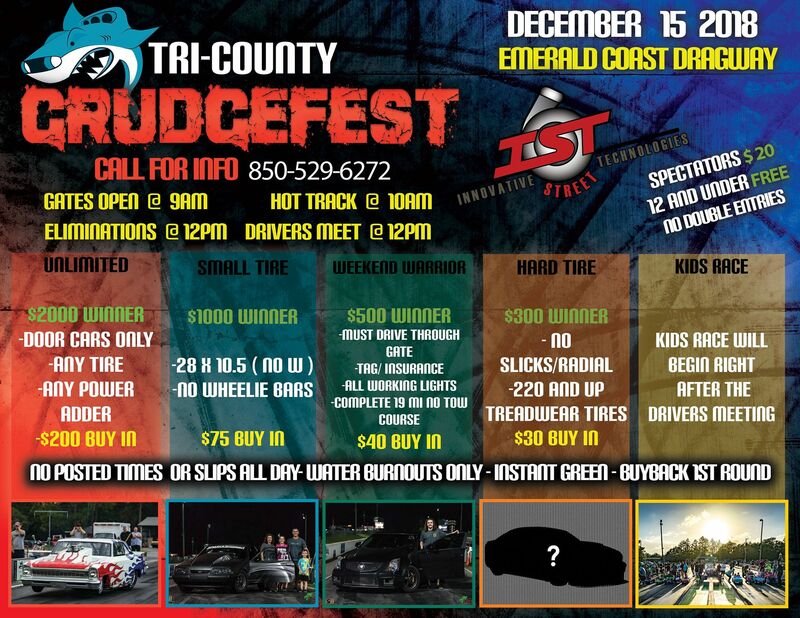 The Tri-County Grudge Fest is BACK at the Emerald Coast Dragway! The boards will be off, no glue on the track, water burnout only and the tree will be set to instant green. Gates open at 9AM, track hot by 10AM, eliminations right after 12pm driver meeting. UNLIMITED – $200 entry & winner take all – Open to any door car, no power adder or tire rules. SMALL TIRE – $75 entry & $1000 winner take all – 28×10.5 & smaller tires no exceptions. WEEKEND WARRIOR – $40 entry & $500 winner take all – tagged & insured w/pre-race cruise. HARD TIRE – $30 entry & $300 winner take all – no slicks/drag radials w/220 and up treadwear tires. POWER WHEELS – Free Entry w/Prizes & Trophies for all – electric or pedal powered and meant for kids.